Let’s move to Italy, and specifically, to Amalfi Coast, where seafood is a relevant part of the culinary tradition of this region. In Italy, seafood quality is equal to freshness (no brainer here). Most importantly, to really appreciate its freshness, seafood need to be prepared in a very simple way; that is, seasoned with extra virgin olive oil, citrus fruits (preferably lemons), herbs, and some vegetables. When preparing seafood in Italy, it is crucial to choose the right cooking method for every type of seafood. For example, calamari are at their best when fried; anchovies are best when marinated in salt, olive oil, lemon, and herbs; octopus is best when grilled or boiled; swordfish is great when grilled. As far as baking, I discovered a method using a salt crust, which a lot of Italian cooks appreciate since it brings out the best flavor of (white) fish such as sea bass, red snapper, sea bream, or sole. One whole fish such as sea bass, red snapper, sea bream, sole, or any type of white fish. For this recipe, we used a Pezzogna, which is a type of sea bream found in the Gulf of Naples. First clean the fish and remove all the entrails. If you prefer not to do this, you can ask your fish vendor to do it for you. If not, go to Take me Fishing, where you can get a detailed step by step explanation of how to clean, scale, and skin fish. Rinse all coarse salt to be used with water. On a baking pan or tray, cover the bottom with coarse salt. Place fish on top and cover it completely with salt. 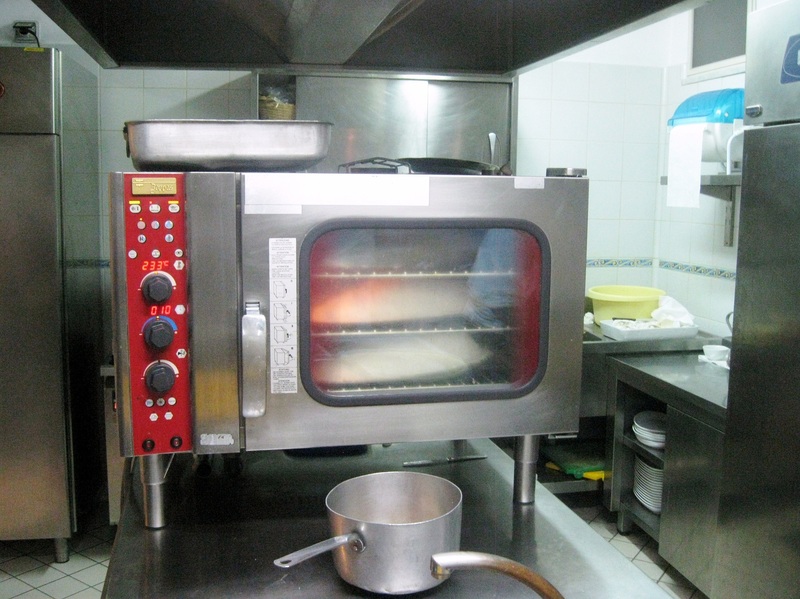 Bake for about 20 minutes at 220 °C (about 430°F). When done, with the use of a wooden hammer, carefully crack the salt crust and remove it to uncover the fish. Skin the fish, and gently remove the flesh making sure you remove all fish bones. 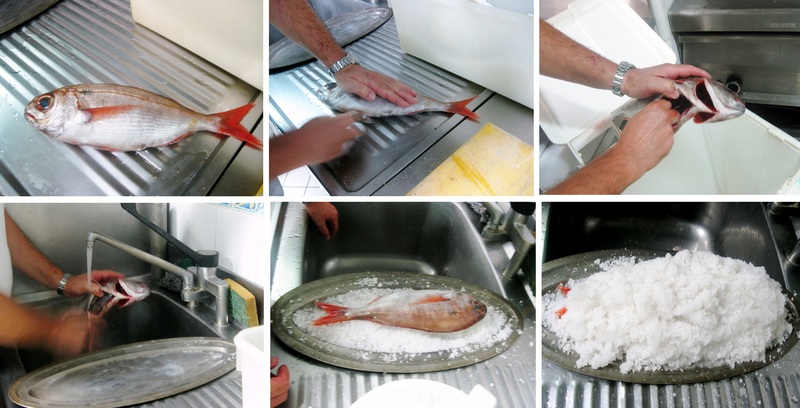 Transfer fish fillets into a dish. The fish fillets fresh flavor was enhanced with this simple sauce made of olive oil, herbs, garlic, and lemon. 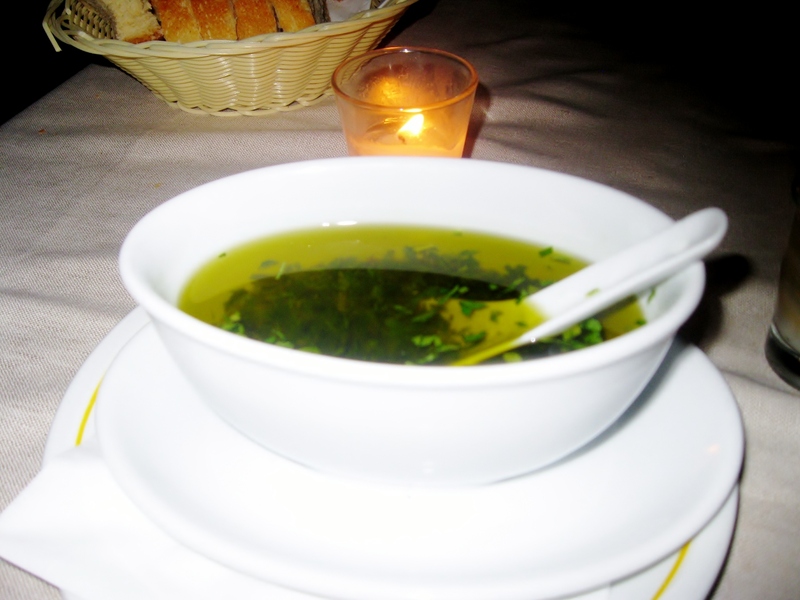 Another great and delicious idea is to use a Salsa Verde recipe, which you can find in one of my favorite blogs – Chica Andaluza . So go to this amazing blog, where you can also find great, creative, and tasty recipes directly from the fascinating region of Andalucia. So here it is, a simple, fresh and delicious way to cook white fish – Mediterranean style. Serving portions vary depending on the size of the fish. I’ve wanted to try this and never have. This is such a great post, so thorough and well photographed and described. Thanks for the inspiration. Thank you Greg!! It is so easy to make!! And thanks for the like!! It’s wonderful to see all the photos of the stages of making this dish. I’ve had it in a restaurant and it looks so spectacular when it’s brought to the table…..one day I may try it at home! It looks spectacular as it is presented, yet it is so easy to prepare! I’ve been tempted to try fish prepared this way before but now, thanks to your thorough instructions, I just may give it a try — and it would give me a reason to try Tanya’s salsa verde, too. Sounds like it would be one great dinner! Thank you!! I hope this is helpful and you really try it! I love fish cooked like this and sometimes we do it at home. In the Spanish supermarkets they sell big bags of salt especially for this. The first time I ate it (in Majorca many years ago) I thought the fish they were going to serve me was going to be enormous (as big as the pile of salt!) until the waiter started chipping it all off and then filleting the fish…great explanatory pictures and than you so much for the lovely mention! I guess this is a Mediterranean way of cooking!!! You are so welcome Tanya!!! Your blog is so inspiring and awesome!!! I too have heard about this method but was never clear on exactly how to do it. You’ve provided a great detailed post on this. I only wish we could get the fresh caught fish you find in the Gulf of Naples! It really looks so delicately tender and moist! This looks wonderful. Oh how I wish we could get such good fish here. Thank you!! Oh..I am sure you can in London!! I have had sea bass prepared this way at a wonderful restaurant in Coral Gables, Florida. It was amazing, the juice that came out when they boned and presented at the table.Thank you for the wonderful step by step directions. This post is wonderful for all of us that want to try this preparation at home. It is such a small world Karen!! My family knows Coral Gables so well!! Thank you for your lovely comment!! I love baked fish but I never thought of using a salt crust.. I love this. You did a wonderful job with this fish and I can’t wait to try it out. 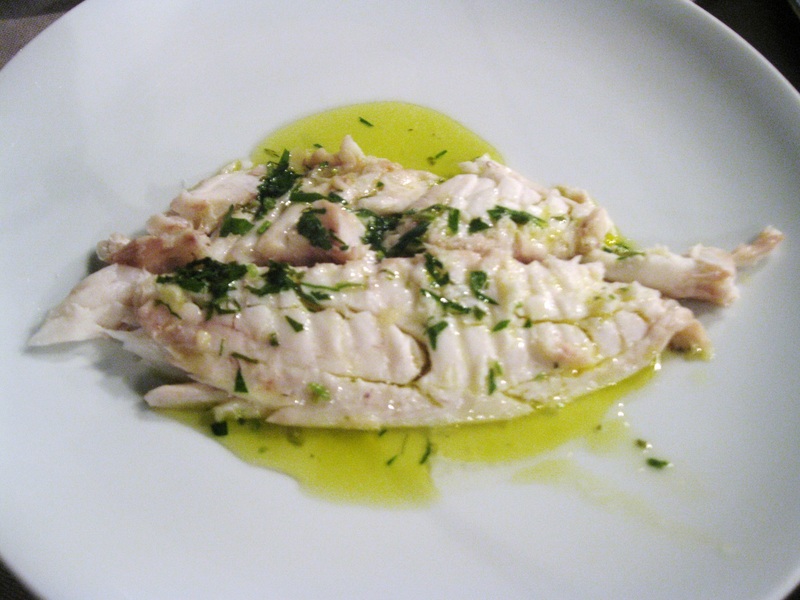 According to many Italians, it is the best way for cooking white fish!! You should try it!! Thanks! !